Another couple of weeks to go for spring time in Paris! Already, flowers are blooming everywhere & terraces of cafes are getting filled by tourist and local alike. it is a time for romance, couple in love wandering around the streets of the city and of course some great lifestyle photography. I took Anna and Igor around the isle saint louis yesterday for a romantic photo session which they ended with a gourmet picnic. What a wonderful idea for a couple in love to grab the occasion of a picnic for some gorgeous photography. A couple’s photo session in Paris is about capturing this special bound & love & tenderness with this beautiful city in the background & professional photos of two happy, loving souls blissfully enjoying the City of Lights together. Your very special photo shoot can be candid, themed, editorial, or anything your heart fancies. We can assist you with ideas to get your photo session prepared as to using props if you wish. We love balloons, umbrellas, some flowers to play around with during the shoot. Again, it is all up to you! We will make you relax in front of our camera very quickly so that you forget that you are being photographed and can simply enjoy the photo experience together. You can trust our professional expertise. We can custom-tailor every element of your fabulous photo tour as much or as little as you like with transportation, hair and make up services, a short video clip, or props which are always a lot of fun. 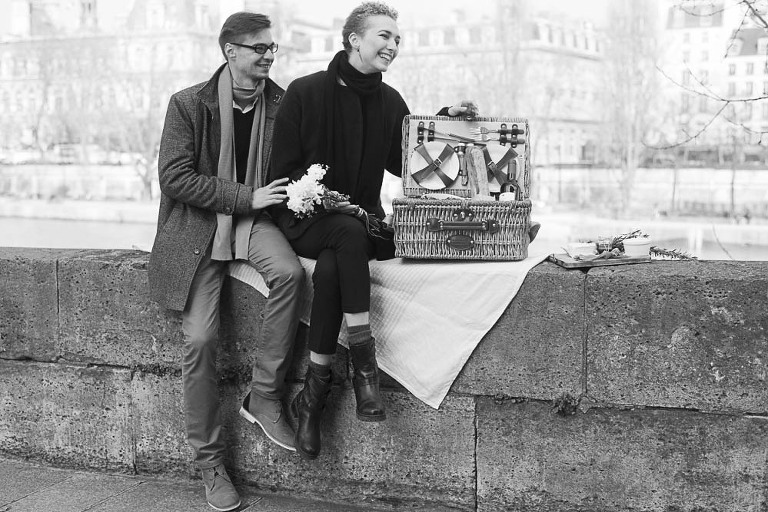 Enjoy Anna & Igor engagement photo shoot around one of our favorite paris landmark. We are looking forward to speaking to you to assist you in the planning of your forthcoming engagement, secret proposal or simply a couple photo session in town very soon.